Police Chief Richard P. St.Sauveur, Jr., has announced that the police department will be changing its shoulder patch design and replacing the design that has been worn since 1973. The new shoulder patch is shaped as a shield, which is a very popular law enforcement patch shape. It prominently displays three blacksmith hammers, which were included on the original Town seal, and appear on the current Town seal. According to the Town’s website, these blacksmith hammers have come to represent the villages of Greenville, Georgiaville, and Esmond. The new patch also includes the year “1950,” as this was the year in which a permanent police force was established in Smithfield. The colors of the new shoulder patch have very specific meaning. The patch is bordered in Black to signify the mourning of the loss of our brother and sister officers, who have made the ultimate sacrifice protecting their communities. The police profession is typically associated with the color Blue. As such, the blue within the patch represents law enforcement and the many dedicated officers serving their communities every day. The Black & Blue colors, side-by-side throughout the patch, are intended to symbolize the universally accepted colors of the National Law Enforcement Officer Memorial mourning band and ribbon. “Smithfield Police” is purposely colored in White, as white signifies the purity, peace, and calm that is expected of our police officers. White also represents the color of protection. The Gold signifies optimism, confidence, higher ideals, wisdom, understanding, generosity, giving, and compassion. These are qualities and characteristics that we expect from Smithfield Police Officers. 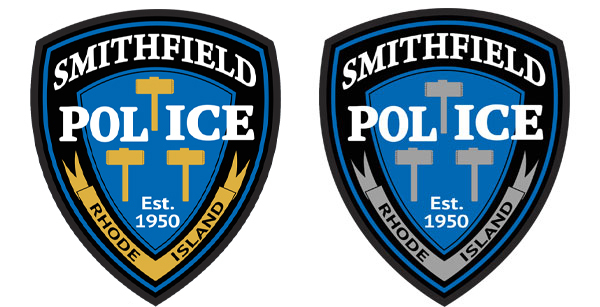 The “official” Smithfield Police Department shoulder patch and logo will contain the color gold. This patch will be worn by all officers holding the ranks of Lieutenant through Police Chief, as these officers’ uniforms are trimmed in gold. The ranks of Patrol Officer and Sergeant will wear a patch that replaces gold with silver, as their uniforms are trimmed in silver. 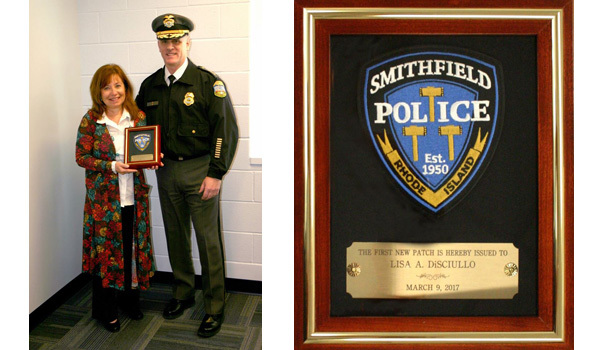 The Smithfield Police Department will begin wearing the new shoulder patch on April 24, 2017. All proceeds will support the Smithfield Law Enforcement Explorers program. 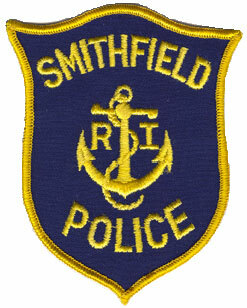 The Smithfield, Rhode Island police patch shown above is a six-color shoulder patch depicting Smithfield Police Department Headquarters. The patch has been worn since 1973/1974, right after the station was first constructed. The patch was designed by the late Lieutenant Saverio E. Serapiglia, the late Captain Prescott J. Williams II, and retired Deputy Chief James H. McVey. The finished design was prepared by local artist Frank Iafrate, who also designed the United States Seabee logo. 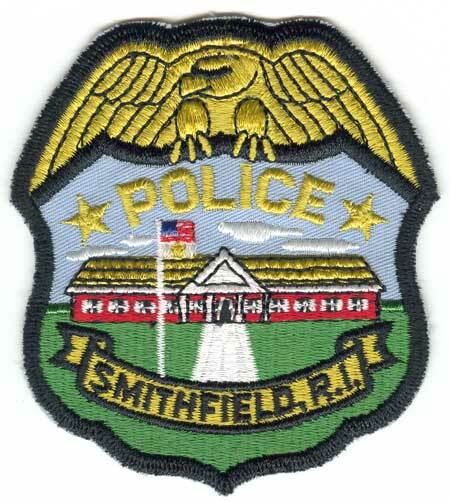 Pictured above are the old style Smithfield PD patches that were worn prior to 1973/1974. 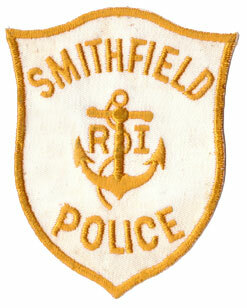 This is the same style patch that was worn by many Rhode Island police departments until the 1970’s – only the city or town name on the top of the patch was changed. The white-background patch was believed to have been worn by higher-ranking officers but this has not been confirmed. 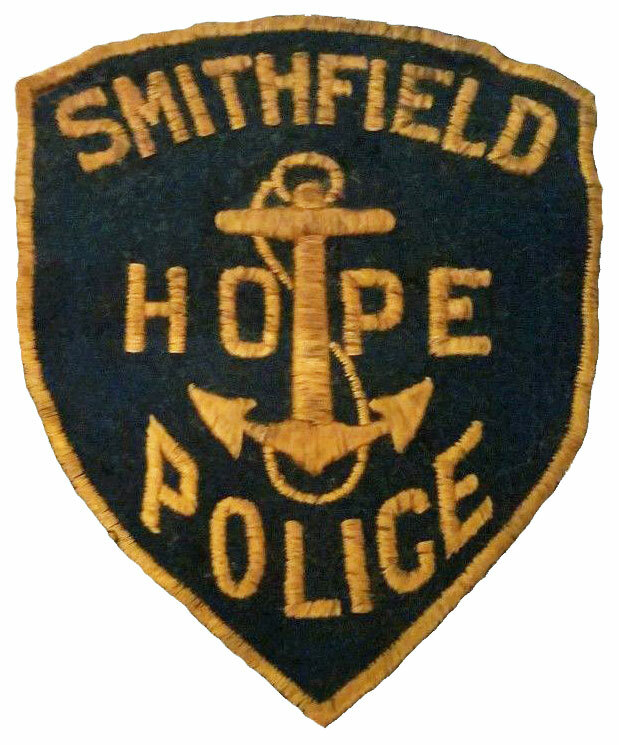 This HOPE patch (pictured above) is believed to pre-date the RI/Anchor patches above it. These patches are not available for purchase.